After some reflection, I recalled times when I used the art form of collage to help me focus my life or to create a cover for a new journal that showed where I was emotionally, mentally, or spiritually at the time. It was always fun and often a surprise as I would start out thinking that I would go in one direction but ended up in another. And so it is that I just decided to create a collage today. My collage is pictured above. It reflects my need to grow my inner garden, to nourish myself in this new year finding balance to take care of me, do my work, and help others. 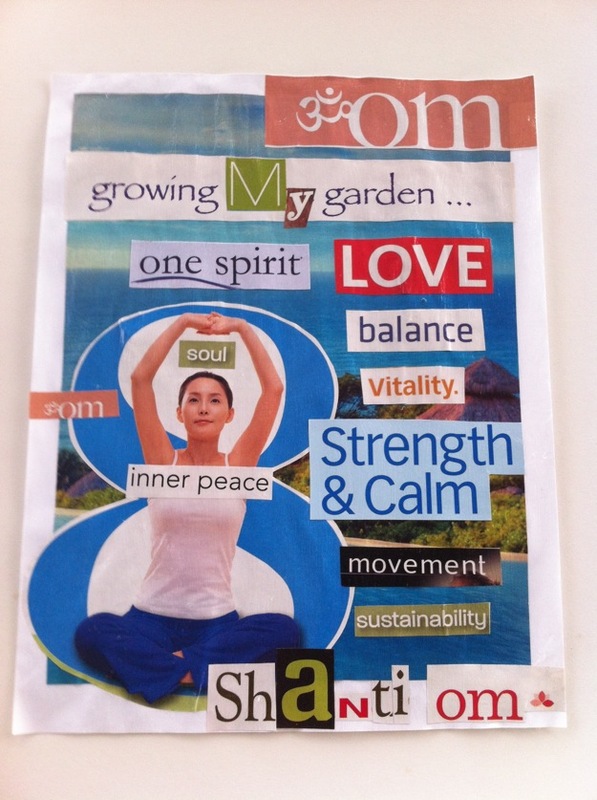 Before I started, I sat in silence setting my intention to create a collage that reflected what I needed this year. The word TIME was loud and clear in my mind. Then I started the process of looking through magazines for pictures and words that expressed that need. It is interesting to me that I didn’t use the word time but found the phrase ‘growing in the garden’ (I changed it to ‘growing my garden’.) instead. To me, that phrase means the same, for growing takes time. So, it fits perfectly! Finding words, phrases, and photos was a treasure hunt. I just cut out what resonated with me not knowing if I’d use these little clippings or not. When I had a good sized collection, I began to put things together on a sheet of paper, and voila, the collage unfolded in a beautiful way. Each one of the words is something I hope to nourish in my garden this year: one spirit, love, balance, soul, vitality, inner peace, strength, calm, movement, and I wish for sustainability, the ability to maintain, or if needed, regain these qualities within myself, for myself so that I can be better able to be joyfully present in all apsects of my life. Of course, I must now determine how I can achieve these intentions. Reflection is needed, but I’ll start with a mantra I have used before, ” I am peace. I am love. I am calm.” It’s certain to lead me in the right direction for if I am these qualities, other needs can more easily happen. *Look through magazines for words, phrases, and pictures that appeal to you. A word might come to you that you can’t find in print so just find the letters needed to spell it. *When you feel complete, use a glue stick to arrange the clippings. *Once you’re satisfied with the arrangement, use several coatings of Mod Podge to glue and finish your collage. *Find a prominent place for your collage where you will see it every day and be reminded of your intention. *Determine how you can achieve your intention(s) and nourish your garden so that you grow and bloom. And so with a smile on my face and in my heart, I move into the new year . . . . .
Love it, Sandster! I am using the word PEACE. I have started by drawing the word in large, fat letters in my art journal. I have colored them in shades of blue and green. I am writing phrases down as they come to me. “I’ve got peace like a river,” “Peace, I ask of thee, oh river,” and so on. I think I will do a “word splash” and see what comes up. I’ve only begun. I’ll let you know what else appears. I am going to magazine collage it too. That is always so much fun. A beautiful share, Sandst. Thnx!